A researcher at The University of Toledo found the first proof of grass carp, a type of invasive Asian carp, spawning in the Maumee River. 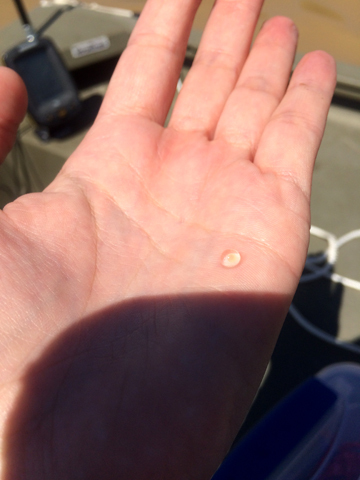 Nicole King, aquatic ecology research technician at the UT Lake Erie Center, collected five grass carp eggs in mid-July just downstream of the I-80 bridge, approximately 11.2 river miles from Lake Erie. Nicole King held a grass carp captured in early spring. The U.S. Geological Survey used genetic testing to confirm that three of the eggs collected from the Maumee River are from grass carp. The other two eggs have been retained for possible future analysis. “These fish have been known to be in the Maumee River area and known to ascend the river during high-flow events, so the fact that they spawn there is not surprising,” said Dr. Christine Mayer, UT professor in the Department of Environmental Sciences. “While this finding does not indicate the number of grass carp in the Maumee River or Lake Erie, it does underscore the continued need to refine the understanding of where grass carp are currently found so that agencies can take on-the-ground actions,” the U.S. Geological Survey released in a statement. King also is one of the researchers who found more than 7,000 grass carp eggs earlier this year in the Sandusky River, another tributary to Lake Erie. Last month King participated in a two-day, multi-agency expedition led by the Ohio Department of Natural Resources Division of Wildlife targeting grass carp in the Sandusky River to assess the ability and best practices to capture grass carp. Crews collected a total of eight adult grass carp using electrofishing boats, gill nets and fyke nets. The action was in preparation for a large-scale, planned response in 2018. 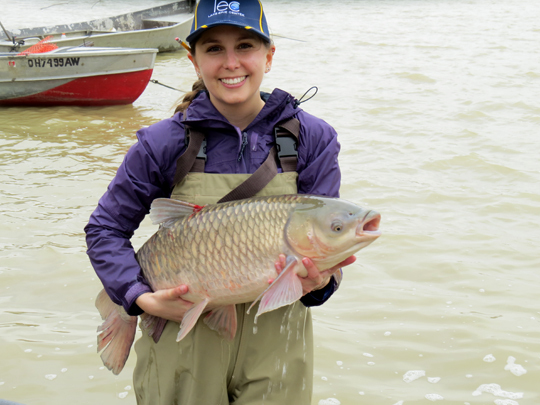 In 2015 in the Sandusky River, UT graduate student Holly Embke was the first researcher to discover grass carp, a type of invasive Asian carp, spawning in a Great Lakes tributary. Although considered a species of Asian carp, wild adult grass carp pose significantly different risks to the Lake Erie ecosystem than bighead carp and silver carp, which are the two invasive Asian carp species of great concern in the Mississippi River basin. Both bighead carp and silver carp consume plankton, and if these species were to make their way into the Great Lakes basin, they would compete for the same source of food that ecologically and economically important native fish species need to survive. Silver carp are well-known for their jumping ability. Grass carp pose a risk to waterfowl habitat and wetlands, but they do not eat plankton and are unlikely to compete directly with native fish. Grass carp do not jump and are primarily herbivorous. “One of the goals of carrying out research on grass carp is to provide information about how other Asian carp species might behave if they ever arrive in the Great Lakes,” Mayer said. This entry was posted on Tuesday, October 3rd, 2017 at 10:57 am and is filed under Natural Sciences and Mathematics, News, Research, UToday .